Recent Arrival! Navigation/NAV/GPS, Heated Leather Seats, Sunroof/Moonroof, 7 Passenger/Third Row, 4x4, New Tires, Good Brakes, Towing Package, Back-up Camera, Bluetooth Hands Free, Lane Departure Warning, Satellite Radio, Black w/Leather Upholstery, 14 Speakers, 21" x 10J AMG® Twin 5-Spoke Wheels, 4-Wheel Disc Brakes, ABS brakes, Adaptive suspension, Air Conditioning, AM/FM radio: SiriusXM, Anti-whiplash front head restraints, Auto tilt-away steering wheel, Auto-leveling suspension, Automatic temperature control, Blind spot sensor: Blind Spot Assist warning, Child-Seat-Sensing Airbag, Dual front impact airbags, Dual front side impact airbags, DVD-Audio, Electronic Stability Control, Emergency communication system: mbrace2, Front Bucket Seats, Front Center Armrest w/Storage, Front dual zone A/C, Fully automatic headlights, Genuine wood console insert, Genuine wood dashboard insert, Genuine wood door panel insert, harman/kardon® Logic 7® Surround Sound System, harman/kardon® Speakers, Heated door mirrors, Heated front seats, Heated/Ventilated Multi-Contour Front Bucket Seats, High intensity discharge headlights: Bi-Xenon, Illuminated entry, Knee airbag, Leather steering wheel, Leather Upholstery, Memory seat, Navigation system: COMAND, Occupant sensing airbag, Outside temperature display, Overhead airbag, Power adjustable front head restraints, Power driver seat, Power Liftgate, Power moonroof, Power passenger seat, Power steering, Power windows, Premium audio system: COMAND, Rear air conditioning, Rear fog lights, Remote keyless entry, Roof rack: rails only, Security system, SIRIUS XM Radio, Speed control, Speed-Sensitive Wipers, Spoiler, Steering wheel memory, Steering wheel mounted audio controls, Telescoping steering wheel, Tilt steering wheel, Traction control, Ventilated front seats. Clean CARFAX. 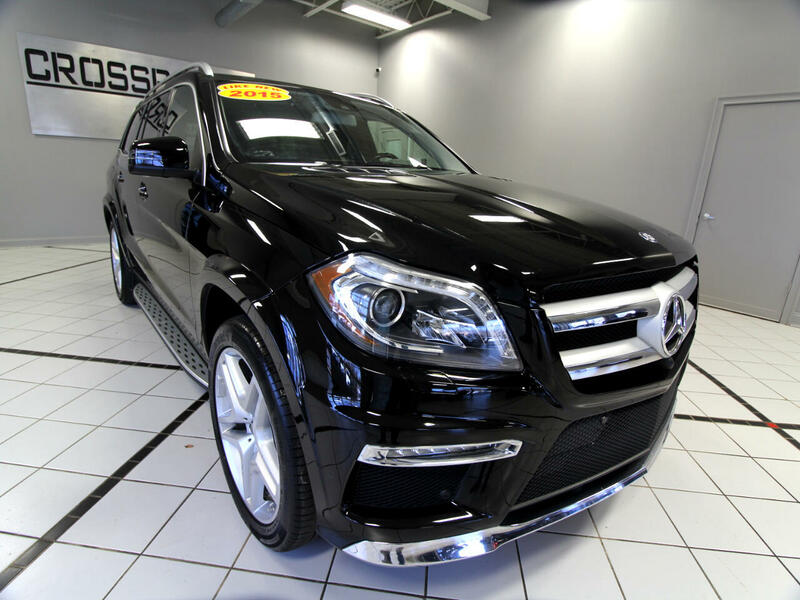 Obsidian Black Metallic 2015 Mercedes-Benz GL-Class GL 550 4D Sport Utility 4MATIC® 4.7L V8 Twin Turbocharged 7G-TRONIC PLUS 7-Speed Automatic Reviews: * Just because you have the need to carry more than four passengers or tow a 7,500-pound trailer doesn't mean you have to sacrifice your standards. The full-size 2015 Mercedes GL-Class delivers workhorse-like performance in a luxury vehicle respected by valets from Manhattan to Monaco. Source: KBB.com * Room for seven adults; authoritative power; available fuel-efficient diesel V6; classy and quiet interior; strong brakes. Source: Edmunds * The 2015 Mercedes-Benz GL-Class makes a definite statement. It possesses a strong stance, beautifully sculpted lines along its side profile, a skid plate under the front bumper, and a huge front grille. It is offered in 3 distinct models: the GL350 BlueTEC, GL450, and the GL550. The GL350 BlueTEC comes equipped with a 240hp, 3.0Lr turbo clean diesel V6, and can get an EPA estimated 26 MPG on the highway. The GL450, has a 362hp, 4.6L biturbo V8, while the GL550, also with the 4.7L, gets 429hp. 4MATIC All-wheel drive is standard with the GL-Class, and all engine options are paired with 7-speed automatic transmission. The GL-Class has a stylish, refined cabin that pampers you in luxury and comfort with all the controls you need easily within reach. Plus, there is 93.8 cubic feet of cargo capacity when the 2nd and 3rd rows are folded down. The base GL350 comes standard with such features as dual-zone climate control, sunroof, rearview camera, Bluetooth audio streaming, power tailgate, heated front seats, and power-folding third-row seats. Available option packages let you customize your GL to your tastes. The Premium 1 Package offers navigation, 14-way power front seats, Heated and cooled cup holders and more. The Driver Assistance package gives Active Blind Spot Assist, DISTRONIC PLUS with PRE-SAFE Brake, and Active Lane Keeping Assist. Further, the Parking Assist Package offers the Surround View System and PARKTRONIC with Active Parking Assist.